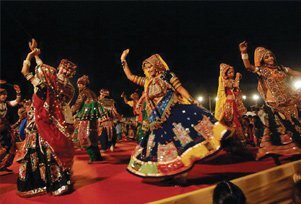 Description of Gujarat festivals is incomplete without the mention of Navratri. Celebrated for nine long days with huge pomp and show, Navratri is dedicated to all the nine forms of Goddess Durga. Communities come together to dance in unison during garba, a seemingly simple dance, where the crowd moves together in a synchronised circular movement. Navratri means 'Nine Nights,' the festival is commemorated for nine long days to perform a Puja to one of the nine forms of Goddess. All the nine nights are broken-up into sections of three; first three days are for Goddess Durga, who destroyed Demon Mahishasura and also human impurities. The next three days are committed to the goddess Lakshmi, the goddess of spirituality and the last three days are for Goddess Saraswati, the goddess of wisdom and art. Also, Navratri is the time to celebrate the soil fertility and monsoon harvest, represented by a mound of fresh soil grown in which grains are sown. The soil is worshiped and watered for all the nine days of the festival. On the tenth day, Vijayadashami is celebrated. Puja is done to bless vehicles; also it is considered as an auspicious day to purchase one. Multiple fables and tales link the origin of the festival. The story goes like this: Demon Mahishasur honored a boon to be immortal by Agni, God of Fire. As per the boon, Mahishasur wouldn't be killed and wounded by any weapon. As a result, Mahishasur became so powerful that he created a terror in the mind of people and caused destruction. To end the terror of demon Mahishasur, all the deities went to Lord Shiva to find a solution. Lord Shiva along with the power other divinities created goddess Adhya Shakti. All the gods and goddesses, including Lord Shiv, gave her ornaments, weapons and lion as a vehicle to fight against the Mahishasur. Goddess Adhya Shakti fought against Mahishasur for nine long days and night. On the tenth day, she beheaded Mahishasur. The nine nights came to be known as Navratri while the tenth day was called Vijaya Dashami, the tenth day that brought the triumph of good over the evil. Apart from religious and traditional significance, during these nine days, people show their best moves and do the garba and dandiya. One can hear the constant noise of sticks and dhols all over the Gujarat for the nine long days. On all days, an evening arti is performed in which garbi, a tradition earthen a port with diyas is used that signifies prosperity. 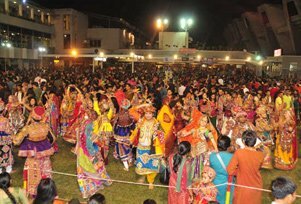 After the arti, all the people gather and put their best foot forward for garba and dandiya dance. Garba is a dance form in which the crowd moves together in a synchronized circular movement. Ashapura Mata-no-Madh in Kutch, Khodiyar Mandir near Bhavnagar, and Chamunda Mata Mandir at Chotila on the Ahmedabad-Rajkot National Highway are some of the major temples in Gujarat that hosts the best Navratri festival. Seeing people dancing in tune with outfits of gold and silk is a sight to behold. When: October or November. The festival begins on the first day of the Hindu month Ashwin. Disclaimer: One will have to check official website of Gujarat tourism before planning a trip to this festival.